More and more good sized Mahi-Mahi are showing up offshore in the areas of our Ft. Lauderdale fishing trips. These fish continue to move relatively fast through the area and they would seem to be primarily pursuing schools of Flying Fish as we noted before. 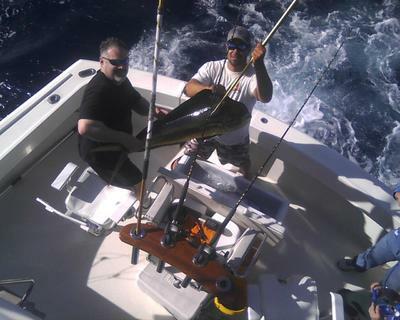 Pictured is Richard with a nice just landed fish with 1st mate Brian. A bit more wind again the last couple of days making for a slightly higher sea for our fishermen. But still very fishable. These onshore winds really blow a lot of seaweed up on edges and rips so there are a lot of interesting areas offshore holding the weeds. And if the weeds are holding bait there are often Mahi right there as well. These Flying fish that really have the attention of the Mahi can be anywhere but many offshore current edges no matter how slight and possibly holding only very few weeds or even weedless are harboring schools of these flyers. This can be fun and exciting fishing when these conditions exist. Staying focused on the surroundings can pay off big. Plenty of sun still with no rain offshore on us now for several days, but there is rain and more wind in the forecast. Good northern flow in the Gulfstream and plenty of weeds in crystal clear water offshore.